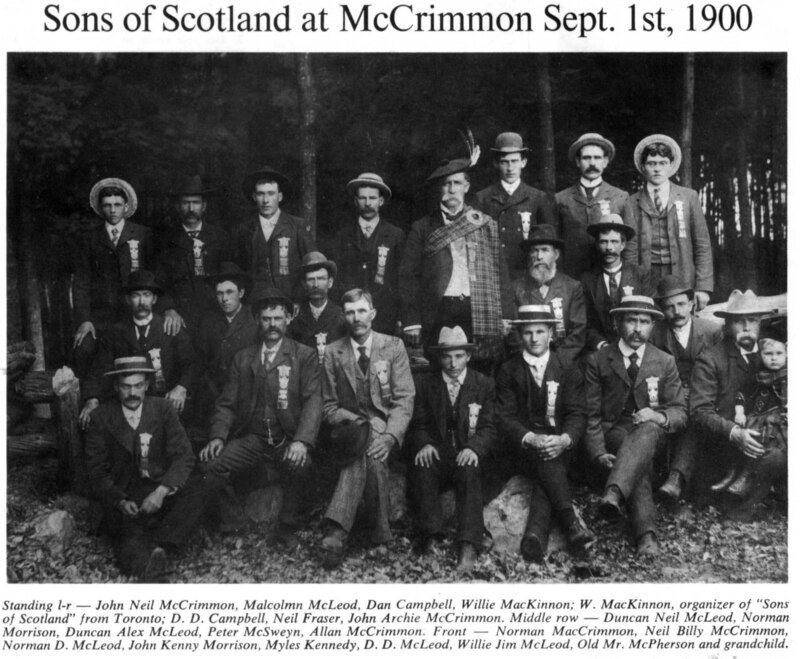 This ' Sons Of Scotland at McCrimmon Sept 1st, 1900 ' photos & article and Glengarry History article elsewhere on History page came from the Scotian, Official Organ of the Sons of Scotland Benevolent Association, Volume 7 No. 4, Toronto, June 1973 Summer Edition. Middle Row L >>R; Duncan Neil McLeod, Norman Morrison, Duncan Alex McLeod, Peter McSweyn, Allan McCrimmon. Front L >>R; Norman MacCrimmon, Neil Billy McCrimmon, Norman D McLeod, John Kenny Morrison, Myles Kennedy, D D McLeod, Willie Jim McLeod, Old Mr McPherson and grandchild. We are grateful to Mrs. A. McLeod of Willowdale, Ontario for sending us the above picture and names of our McCrimmon Camp. This Camp was organized in 1892 with 70 members. The picture above was taken at their annual picnic. Mrs. McLeod also sent us a photo copy of the original charter. 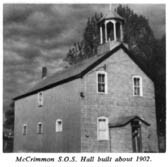 There is still a Sons of Scotland hall in McCrimmon built by the members - on land donated by one of the Charter members Neil McCrimmon. Altho' the S.O.S. isn't active there now the Hall is still being used by Orange Lodge 771, women's institute meetings, for bridal showers, wedding receptions etc. They truly built the Hall to stay. It was used during both world wars when parties were held for members of the armed forces. It was also used at one time as a Sunday School for the children of the community. The Organizer from Toronto was D. P. McKinnon and the District Chief was A. Campbell of Kincardine, Ontario. End of article from the Scotian.